The only damage we’ve had in our yard recently is due to all the deer in our neighborhood! Our gorgeous sweet potato vines have come back (and look awesome!) but they’ve attracted the usual fans. Jim and I go out every morning and see new nibbles here and there. I guess next year we’ll have to plant a less popular green. Other than that, we are enjoying the signs of late summer. Our Butterfly Bush has lived up to its name and has attracted all sorts of beautiful butterflies and hummingbirds throughout the season. And now that fall is on its way, the lirope are in full bloom! It only happens this time of year! 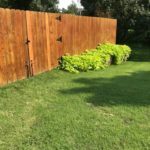 With summer coming to a close, we’re hoping that we’ll get one more bloom out of our roses and only have to do one more trim on all the bushes and hedges before the temperature drops again. What plans do you have for your garden now that the summer season is winding down? What have you enjoyed the most these past couple of months? We hope that whatever your gardening and landscaping choices have been, you’ve been able to enjoy that space with friends and family. From our backyard to yours, we’re wishing you the very best for your last days of summer.